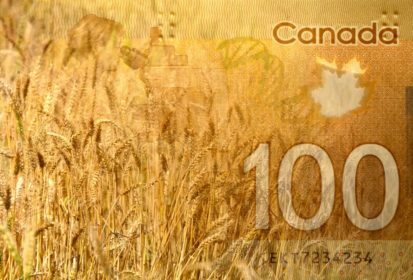 CNS Canada – North American wheat prices have rallied sharply over the past few weeks and could have more room to go, especially for higher quality and higher protein wheat. After trending lower for most of June and into early July, the Minneapolis December spring wheat contract settled at US$6.2275 per bushel on July 31, an increase of about 75 cents over the past two weeks. The contract traded as high as US$6.60 per tonne in late-May, and a retest of those levels is possible, according to Bryan Strommen of Progressive Ag in Fargo, North Dakota. He said production issues in Russia, the European Union, Australia and even China all contributed to the gains in North American wheat prices. A crop tour of the United States spring wheat growing regions also “gave it a shot in the arm” by predicting slightly lower-than-expected yields. “A lot of guys just didn’t get the rain when they were needing it,” said Strommen. He said disease issues were also being reported in some areas. As a result, he expected Minneapolis spring wheat would gain some ground relative to Chicago and Kansas City winter wheats, with Kansas City hard red wheat also likely to rise relative to the Chicago soft wheat. “We should see the protein wheats carry a premium to Chicago,” said Strommen. While many factors are pointing to higher prices, Strommen added that “exports have been less than stellar.” While the production problems elsewhere in the world should be drawing more demand to U.S. wheat, that buying interest hasn’t come forward yet. The trade issues with China are another bearish influence in the background, as a continuation of the dispute could see U.S. farmers seed fewer soybean acres going forward and more wheat and corn.